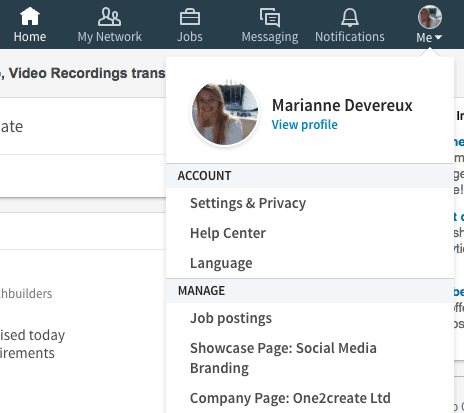 One2create / Social Media / LinkedIn Changes – Is Your Business Ready? 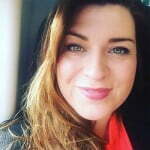 LinkedIn Changes – Is Your Business Ready? There are changes happening at LinkedIn. You’re likely to have noticed if you’ve logged on in the last few months and were greeted with a new, clean design. However, it’s not just the design that’s changed. As experts in social media, we want to make sure you and your business pages are prepared for when these changes are no longer just a preview. That’s why we’ve created this blog, so sit back, relax and keep reading for our tips. 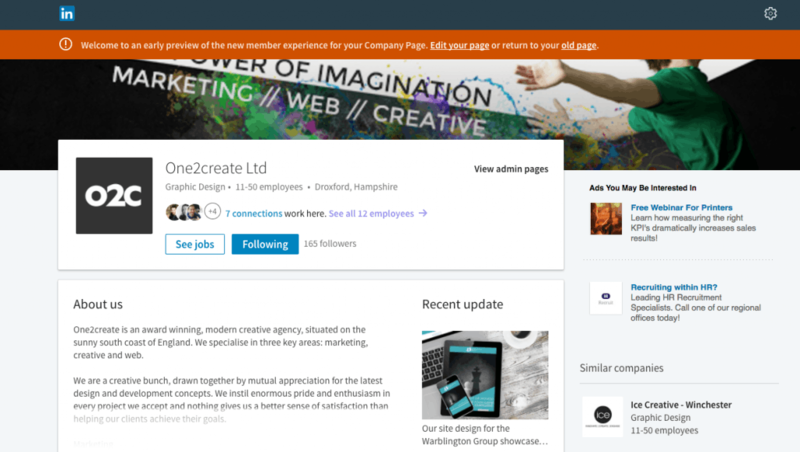 One of the biggest changes affecting business pages will be the banner images. 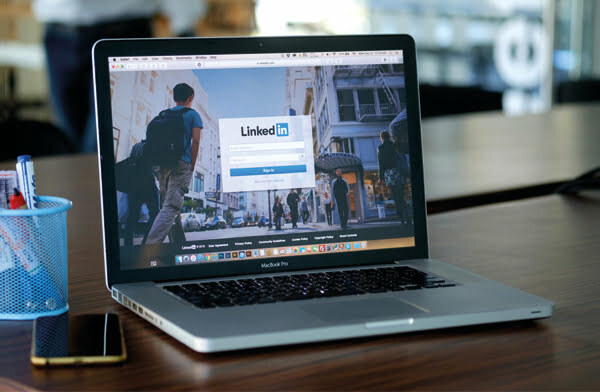 LinkedIn has increased the size dramatically, meaning you could be left with some confusing stretched images, or even a blank space if you haven’t updated your banner. The new recommended sizing is 1536 x 768px. However, not all of your image will be shown on the new pages so be sure to check if any text is cut off before publishing it. Banners are much more prominent on the new LinkedIn and will follow you around so making sure your design works is important. Rich media now features heavily in the new design. Images are shown larger in posts, so if you do have any content that could be classed as an image, it would be worthwhile making sure it’s high quality. This could include tips or testimonials from previous clients. Recent posts are now featured at the top of your business page. These can be very effective and engaging, especially if there is an image included in the post. For more tips on how to use social media to your advantage, have a look at our infographic. On desktop, a summary of your profile will appear on the left hand side. Currently, you can’t view your profile rating; however this is visible on mobile. LinkedIn has stated that this should be returning to desktop in the future. So if you’re desperate to see your rating, you’ll have to stick to checking on mobile for the moment. Any company pages you’re an admin of will appear under the ‘Me’ section in the top right. This section also allows you to edit your profile, or privacy and settings. Similar to business pages, your header image size has changed. This is the same size as a business header (1536 x 768) so again, make sure no information is cropped out of your image before publishing. Your headline text will now be visible in every action you take. When sending a connection request or if you share content, your headline will be visible. Making sure key information is included could help to boost your profile. This needs to be more than just your position and company name. Profile summaries now only show two lines of text before the ‘show more’ option, so check that your key points are above this line. You could also include call to action text, encouraging people to read on. You are no longer able to change the order of section on your profile, but apart from that everything is the same. Interests has become ‘More’. 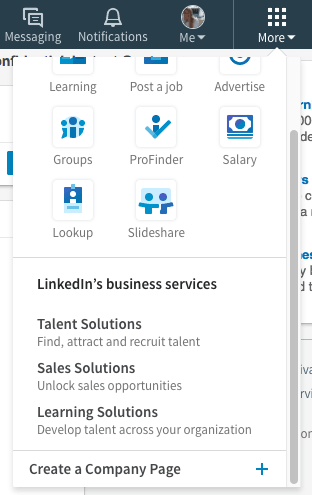 Under this tab, you’ll be able to access other LinkedIn sites such as Slideshare. At the bottom of this tab is where you’ll find the option to create a company page. There is now a bigger focus on notifications, encouraging more interaction, with a whole tab dedicated to them you’ll be reminded of work anniversaries or see who’s followed you. This tab also makes it easier to respond and engage with followers. What do you think of the new design? Are you struggling to get to grips with it, or do you prefer the new layout? We’d love to hear your thoughts, so let us know in the comments below. Alternatively, you can give us a shout out on Twitter here or on Facebook here. If you’re struggling to keep your social media engaging and up to date on events throughout your industry sector, then why not find out how we can help!